Many people still remember the excitement and apprehension of the first day of school and Mungere’s students are no different. 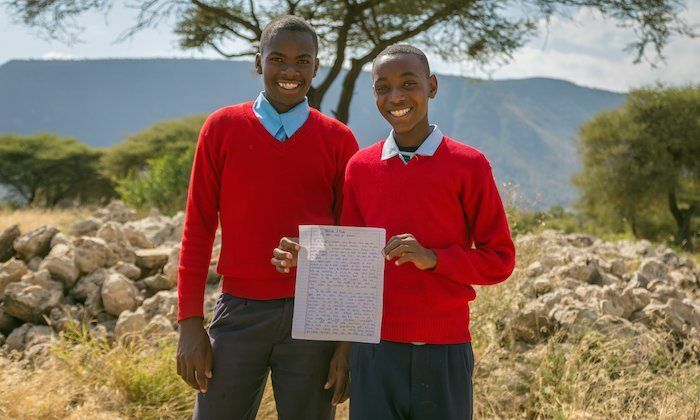 As part of a recent writing class, two teenagers put pen to paper to describe their first few weeks at Mungere School and how they began to learn English. All secondary school lessons in Tanzania are taught in English while primary school classes are conducted in their native Swahili. This means that students can struggle at secondary school until they have mastered their new language. Mungere School offers a revolutionary approach to this problem—all new students go through an English immersion program conducted over several months by native speakers. Form III students Faustine Amiri and Mussa Benjamen described their nerves and doubts at the start of their secondary school education and how they learned English. It was the morning of 16th of September 2013. Everybody was excited to be here in Mungere Secondary School. We were newcomers and we asked ourselves "will we ever be able to speak English as our dear brothers and sisters?" We were not able to speak so we were given some weeks to study and learn English. We were struggling so much because we had to speak English as our language of communication here in Mungere Secondary School. Everybody was wondering, in his or her way, about being selected to deliver a morning talk in assembly in front of students who already knew how to speak English. They had English in their heads and we were worried they would be correcting all of our words as we were speaking. The day came and passed when we had to deliver a morning talk and we were somehow good. We were also able to speak and write even a little English on our own. Once a teacher asked questions, we were able to volunteer to answer the questions but we were still not confident. However the teachers could teach the ways of having confidence. How to speak in front of a class without hiding, using a book or looking down. This is how we got to know English and have confidence. During English class we did spelling competitions so we were able to write and speak grammatically well. Also we asked our older students when we didn’t know something. We asked ourselves ‘how can we stay in school without being afraid of our teacher?’ Then we found that being friends with our teachers and asking questions made us smarter in class and academically successful. Create a unique relationship while changing a child's life. Subscribe to our newsletter and stay up to date with Mungere School and Red Sweater Project. Red Sweater Project is the sole owner of information collected on these sites and only collects information you voluntarily provide via email or other direct contact. Red Sweater Project will not share, sell or rent this information to anyone, including any third party, other than as necessary to fulfill your request. Unless you request otherwise, Red Sweater Project may contact you via email to provide information you may find helpful. You may opt out of any future contact from Red Sweater Project at any time by contacting us via the email address or phone number provided at the bottom of each website page. In addition, you may contact Red Sweater Project to • See what data we have about you, if any; • Change/correct any data we have about you; • Request that we delete any data we have about you, or • Express any concern you have about our use of your data. Red Sweater Project takes precautions to protect your information. When you submit sensitive information via the website, it is protected both online and offline. Wherever Red Sweater Project collects sensitive information (such as credit card data), that information is encrypted and transmitted to Red Sweater Project in a secure way. You can verify this by looking for a closed lock icon at the bottom of your web browser or by looking for “https” at the beginning of the address of the web page. While Red Sweater Project uses encryption to protect sensitive information transmitted online, it also protects your information offline. Only employees who need the information to perform a specific job (for example, sponsor support or fundraising) are granted access to personally identifiable information. The computers/servers in which Red Sweater Project stores personally identifiable information are kept in a secure environment. In order to access our newsletter or make a donation, a user may be required to provide certain information (such as name and email address), which is used to contact you about Red Sweater Project programs in which you have expressed interest. Further information may be required in order to make a recurring donation, such as a student sponsorship. Red Sweater Project websites may contain links to other sites. Please be aware that Red Sweater Project is not responsible for the content or privacy practices of such other sites. Red Sweater Project encourages its website users to be aware when they leave Red Sweater Project's website and to read the privacy statements of any other site that collects personally identifiable information. From time-to-time our site requests information via surveys. Participation is completely voluntary and you may choose whether or not to participate and therefore disclose this information. Information requested may include contact and demographic information (such as zip code, age level). Survey information will be used for purposes of monitoring and/or improving the use and satisfaction of Red Sweater Project sites.